Pros: Funny, well-acted and full of laugh-out-loud moments. Cons: Lacking a well-rounded ending. A riotous, entertaining and excellently staged performance. 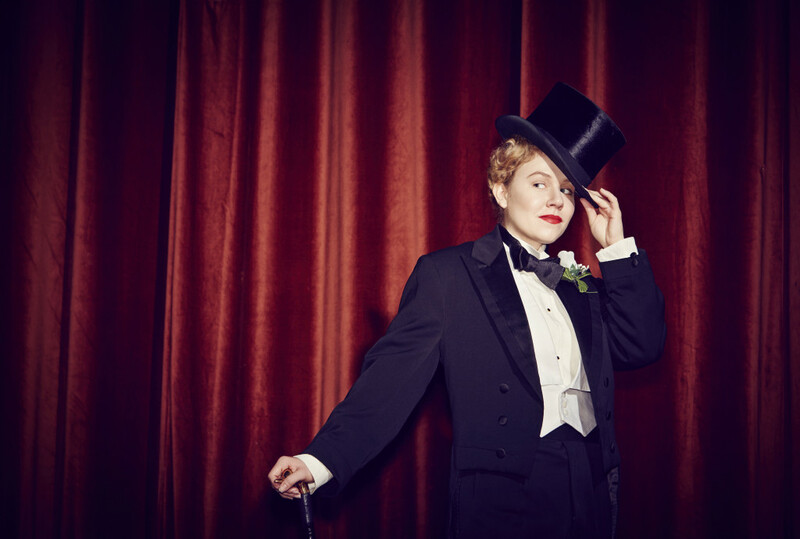 Tipping The Velvet is an amusing and moving coming of age play based on the Sarah Waters book of the same name. Nancy, a young and wide eyed oyster girl from Kent falls for a local male impersonator and runs off with her to London. There, her life is twisted and turned upside down as she struggles to learn who she is as a person and sexually in London in the late 1800s. The play includes musical numbers and although the play is set long ago, the music performed is decidedly modern. Compere (played by the faultless David Cardy) plays narrator and puppet master for Nancy – an appointment which moves the evening along well. 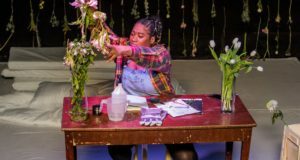 The Lyric Hammersmith is an outstanding choice for a play that finds life in a music hall. The stage area is well utilized for Nancy and Kitty’s performances and the space afforded by the staging allows for very convincing and well-spaced sets. There’s a lot of incredibly well orchestrated blink-and-you’ll-miss-it set changes and the entire production is very well-rounded. The cast are excellent; Sally Messham absolutely shines as the naïve, yet rough and ready Nancy. Laura Rogers is outstanding as the sultry Kitty – it’s a shame that Kitty isn’t on stage more, actually – and a very competent chorus keeps the audience amused throughout. For all the serious subject matter, this is actually a very humorous production. The music hall attributes also extend to interjecting one laugh-out-loud moment after another into the show. 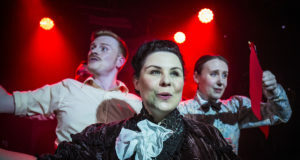 This humour is mixed brilliantly with the aforementioned modern music and a version of “Smalltown Boy” by Bronski Beat performed in Smithfield market is one of the funniest things I’ve ever seen on stage. There’s a lot of great work put into this production and it succeeds even though some elements of it must have been tremendously difficult to bring to life for an audience. In particular, Nancy’s journey and coming of age involves a tremendous amount of sexual awakening and sexual behavior. This production handles the sexual episodes in an interesting mix of beautiful and comical ways. Interlinking and spinning dances on a sort of chandelier form Nancy’s dream-like love making with two women; a series of noise-makers allow for a genuinely funny portrayal of Nancy’s turn at male prostitution, but it’s lovely to see that when Nancy experiences something ‘real,’ the portrayal of the sexual acts isn’t masked behind humour or beauty – it’s very honest and real. The sexual portions of the show do make this unsuitable for children. Nancy makes the acquaintance of a Monsieur you’d rather not have your kids know about and the ‘c-word’ makes an appearance. It’s all very relevant to Nancy’s journey and so needs an inclusion – but as a result, this should be for a more adult crowd. Where it loses some steam is that Nancy can be quite frustrating. She’s been dealt a difficult hand in life, but she also has behaved badly along the way as well. Her heartbreak was not her fault, but her appalling behavior towards her family felt out of line with someone who was rather endearing and determined to succeed – and, spoiler alert – when Nancy has her redemption, there’s no resolving the situation with her family. That’s not to say the ending isn’t good – it is, and it’s lovely to see how far Nancy has come as a person and how she’s managed to change her stars for her future – but I still feel there was more to her story than what the ending allowed for. It’s a long evening at 2hrs 30min, but the entertainment lasts throughout. Nancy’s life is a drama set on the stage and the portrayal of her by the shining Sally Messham very much deserves the limelight.